I have this thing about Jefferson, Texas’ own version of Savannah. As I turned onto Broadway from Highway 59, I did my in-car happy dance. And I was even happier to pull up at the Pride House, my home-away-from-home for the weekend of Jan. 15-18. Jefferson is magical. It’s so steeped in leftover Southern Gothic vibe, with house after house dating back to the 1850s and 1860s, that whenever I turn a corner I think I’ll see a horse-drawn carriage –– wait! I saw horse-drawn carriages driving weekend tourists around the tiny town on Sunday! After an absence of much too long (say, three years), I made a return trip to my favorite small Texas town for the annual Pulpwood Queens’ Girlfriend Weekend, the brainchild of Kathy Patrick, my literary soul sister. Kathy has run Beauty and the Book, the country’s only combination beauty salon and book store, since 2000. With her past as a book sales rep, she’d always been about books and reading. She got the bright idea of starting the Pulpwood Queens of East Texas book club, whose motto is “Where tiaras are mandatory and reading good books is the rule.” (One might add that leopard print something or other is the perfect complement to the tiara!). Read the rest of the story here at DogCanyon. 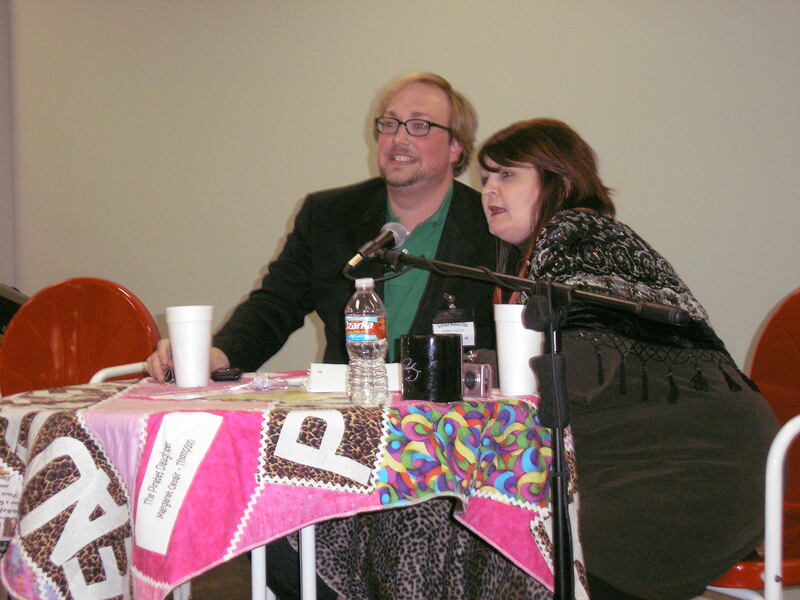 Pictured: Event organizer/Head Pulpwood Queen Kathy Patrick and author Robert Leleux (Memoirs of a Beautiful Boy) teamed up as talk show hosts collectively known as “BobKat” to interview authors throughout the weekend. Side note about DogCanyon: The site is published by Glenn Smith, who taught “Blogging and the Art of the Personal Essay” for the WLT last fall. WLT members Reba Saxon and Greg Jackson also a contributors at DogCanyon, and we’re looking into getting more WLT members published there. Stay tuned for details! Calling all girlfriends! It’s the last call for Girlfriend Weekend, the annual author/book extravaganza for the Pulpwood Queens of East Texas. The brainchild of Kathy Patrick of Beauty and the Book fame, this promises to be a great weekend for anyone who loves books. And it’s THIS weekend, Jan. 15-16, in historic, weirdly wonderful Jefferson, Texas. Kathy is teaming up with author Robert Leleux (a new entity known at BobKat) to put on quite the show. Pat Conroy is the featured speaker at Saturday’s luncheon, and his wife, Cassandra King, is also on the program. Other authors on the program are Elizabeth Berg, Kathi Kamen Goldmark, Suzanne Arruda, River Jordan, and one and on. More details are here. Rumor has it that a certain director of a Writers’ League in Texas may also be around, so if any of you WLT types are there, let’s get together! And guys, don’t feel left out. You’re definitely welcome too. And look out, you might just end up being voted Timber Guy of the year! Kathy is still taking registrations, so contact her ASAP to sign up! kathy@beautyandthebook.com; 903-665-7520 or cell 903-445-2353.